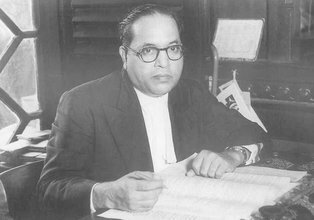 July 20,1942 is a historical and memorable day in the History of India .On this very day Dr. B. R Ambedkar was appointed as labour member( labour Minister) in the Executive Council of Viceroy. He was not only a Professor, Lawyer, Politician, Educationalist and Economist but was also the leader of labours. He had deep knowledge about the plight of labours, because he had himself lived in labour colony. He knew how to get rid of problems of the labours. Dr. Ambedkar worked as a labour member from 1942 to 46. During this period he had enacted many laws / provided many facilities to labours. For the first time a three partite committee (Owner, labour and the Govt.) was set-up to solve the problem of labours. Here we need to discuss his Chhotanagpur( Jharkhand) visit and the contribution of Dr. Ambedkar to this region. AS a member of Viceroy’s executive council Dr. Ambedkar reached Dhanbad on December, 9(Thursday), 1943 to enquiry about the conditions of coal labours. Dhanbad is known as the Coal Capital of Bihar and Jharkhand. In Dhanbad he was warmly welcomed by the then labour commissioner S.N Majumdar, Chief Mining Inspector Mr. W.Kirbi, representative of the Mining Association, Colliery proprietor (Owner) and other Govt. officials, viz Secretary of the labour Dept. (India Govt. ), H.C Preyer and Labour Welfare Adviser of India Govt. Mr. R.S Nimbker was also present. After reaching Dhanbad Ambedkar visited Bhulan barari Colliery with Mr. Preyer, Mr. Nimbker, Mr.W.Kirbi, and other Colliery Owners. Mr. Karnik was representing the Indian federation of labours and Miss Shanta Bhal Rao was representing the All India Trade Union. Wearing Safety Cap on his head Ambedkar got down in 400ft depth Mines of Bhulan barari and saw coal cutter labour. He asked different type of question to labourers (Coal cutters) like education health and other facilities. He closely watched the condition of female labourer and the amenities provided by the Govt. and the Colliery Owner. Ham Ander aa Sakte hai (May I come in)—Ambedkar uttered in Hindustani tone and entered in the residence of labourer. He watched the homes, domestic things and homely utensils etc. Same day he went to Digwadih colliery to see the new machine installed there. He also went underground mines of Tisra Colliery and came to know the situation of labourers there. Next day on December, 10, 1943 labour member went to Ranigunj colliery (now in West Bengal) to study the process of coal production. On the way to Ranigunj Ambedkar visited one primary school. School students garlanded Ambedkar and welcome him. After returning from Ranigunj at Dhanbad on December, 11, 1943 Dr. Ambedkar addressed the meeting of officers of Bihar, Bengal and India Govt and other representative of different labour organisation. Later, on the recommendation of Ambedkar, Labour welfare fund was set-up. Working hours were reduced from 10 hour to 8 hour. Maternity was leave started for female labourer. Finally he shaped the idea of Damodar Valley Corporation(DVC). DVC is the brain child of Ambedkar,s idea and commitment for development..
As a labour and water resources member (minister) he made sanctioned the Tilaiya dam and Maithon dam. Dr. Ambedkar supported small states ,small land holdings and Nationalisation of land. He also wrote a book, Thoughts on Linguistic States, in 1955. He wanted division of States on linguistic base. According to him, Bihar Odisha UP & Maharashtra could be divided. He has written in (W&S,page 181-182) that the capital of South Bihar( Jharkhand) will be at Ranchi and the capital of North Bihar ( Bihar ) will be at Patna..